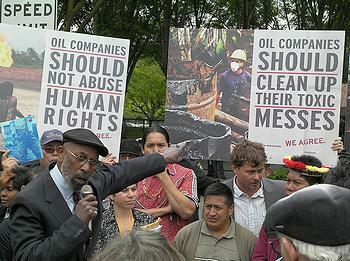 SAN RAMON, California, May 26, 2011 (ENS) – At Chevron’s annual general meeting Wednesday, the oil giant’s chief executive John Watson, the Board of Directors and shareholders were greeted by over 150 activists, who traveled to San Ramon from throughout the world. They came from Angola, Indonesia, Nigeria, Alaska and Ecuador to share their stories of the human and environmental degradation Chevron had unleashed in their communities. “We are the human face of Chevron’s operations, armed with the memories of our dead relatives, our neighbors, our sick children,” declared Carmen Zambrano, a mother from Shushufindi, Ecuador. On February 14, 2011, in a landmark legal victory for indigenous people and farmers, a court in Lago Agrio, Ecuador ruled in their favor. The judge found that Texaco, which merged with Chevron 10 years ago, destroyed vast tracts of the Amazon rainforest by dumping 18.5 billion gallons of oily waste over several decades, damaging residents’ health and degrading the environment, contaminating both soil and water. The judge ruled that Chevron is responsible for cleaning up the pollution linked to Texaco. He ordered Chevron to pay $18 billion in damages, an amount comparable in size to the $20 billion that BP has placed in escrow for victims of the 2010 Gulf of Mexico oil spill. Chevron has appealed the ruling. On Tuesday, the True Cost of Chevron, a network of 40 groups, released a report detailing the company’s human rights and environmental violations. 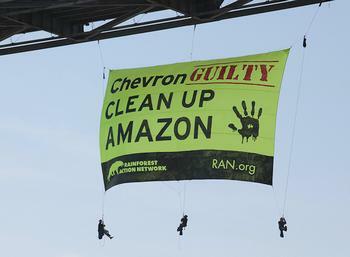 Juhasz expressed concern about Chevron’s interest in expanding its offshore drilling, given the disasterous BP oil spill in the Gulf of Mexico last year. “Chevron, the nation’s third largest corporation and California’s largest, is well aware of the dangers of offshore drilling,” she said. At Wednesday’s annual general meeting, more than 150 supporters rallied in a colorful protest, bringing pressure on the meeting throughout the day. Arriving attendees were greeted by dancing moneybags, intended to dramatize the greed of oil executives. 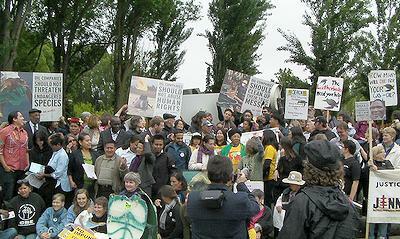 Twenty-two indigenous and other affected community members traveled to San Ramon from around the globe, including Angola, Canada, Indonesia and Nigeria, and regions of the United States, such as Alaska and Texas. 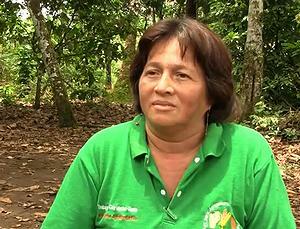 Three indigenous and community leaders from the oil-contaminated Ecuadorian rainforests were there to demand that Chevron to fulfill the requirements of the Ecuadorian court ruling. Residents of neighboring Richmond, California, where Chevron operates a refinery, also attended the meeting, expressing concerns about the refinery’s effects on residents’ health and the area’s environment. They provided a tour yesterday of areas affected by refinery contamination. When Richmond resident Reverend Kenneth Davis attempted to hand a copy of the “True Cost of Chevron” report to Chevron CEO Watson, he was stopped by private security guards. Shareholders attending the meeting also expressed concern about the effect of hydraulic facturing, or fracking, on the environment. Fracking involves drilling of shale rock in order to extract natural gas. It has been criticized for its devastating effects on the environment, which include, the contamination of ground water though chemicals used in drilling, pollution of air quality, and the creation of toxic waste. Chevron did not return calls requesting an interview for this article.